One of the World’s Top 50 Restaurants, perhaps the most difficult venue to obtain a reservation for in America, is apparently operated by one man out of a basement in a village (Earlton, New York) half an hour south of Albany. Servings are reputedly fully booked up through 2020, or possibly 2025. The dining room was snug, seating no more than sixteen guests, with a table set up in the middle as though for a single party of six. It was tidy, not really rustic, more varnished than one might expect. The walls were painted a brushed ochre. A stained-glass panel in the wall read “Good Food” backward. Baehrel had installed it that way so you could read it in a nearby mirror. Along the back wall, a broad table was arrayed with bowls of seeds, nuts, leaves, roots, berries, and mushrooms; Mason jars of sap and flour; and vials of oil, all marked with painter’s tape describing the contents and the vintage—“Acorn oil 8/15,” “Golden Rod flour ’14.” The Native Harvest tag had been his wife’s suggestion. “I was inspired by Native Americans,” he said. “I wanted it to be based on the people who were here in this country before we were.” Supposition was his guide: he said that he had never actually read anything about Native American cuisine. He worked through the items on display. Lily tuber, cattail stems, milkweed, bull thistle. By watching deer in the woods, he had discovered that the inner barks of certain trees have a salty taste. While chopping wood, he found that a particular lichen takes on an oniony flavor for three weeks a year. He made a cooked powder from it. “You’re gonna love it!” Baehrel relies heavily on starch and stock made from rutabagas. He uses wild-violet stems as a thickener. He inoculates fallen logs with mushroom spores. He’ll spend seven hours gathering three-quarters of a pound of clover—enough to fill a steamer trunk. “I do it at night, with a headlamp,” he said. He had me sit at a table in the corner, a two-top, from which I couldn’t see the door to the kitchen. He wanted me to have the dining experience. He said, “Don’t worry, I’m a professional. I’m not going to kill you.” He filled my glass from a pitcher. “It’s sap. Sycamore sap.” It tasted like water, with a hint of something. A few minutes later, he came out with another pitcher. “This is sparkling maple sap, with dried lemon verbena. I have lemon trees in containers, but I don’t get many lemons. Just the leaves.” He said he harvests about a dozen saps: maple, birch, sycamore, hickory, walnut, butternut, beech, hardwood cherry. “Sycamore sap, when concentrated, is a little salty. You can brine things in it. Hickory sap is very briny and salty. Good for long cooking. I’ll brine a pork shoulder in hickory sap and pine needles for nineteen days. Cherry sap is salty and sweet, bitter, with herb hints like marjoram and lavender. I asked him how he’d figured this out. The first course was served on a slab of sawed wood. It was a small rectangle of what looked like salami atop a curled cracker. He said, “It takes me sixteen to eighteen months to make cedar flour. I use a pull knife, a two-handled grater, to shave off some cedar under the bark. The shavings are bitter, tannic—inedible. I soak them in water. Every four to six weeks, I soak them. After a year or a year and a half, I can grind it into cedar flour. So the crisp is made from cedar flour, with a little hickory-nut oil, duck-egg-white powder, water, sea salt, which I sometimes render.” He produced a jar of sea salt from the sample table. “I made the batter and baked the crisp today.” The rectangle of meat, he said, was blue-foot chicken cured in pine-needle juice, pulp, and powder for eighteen months. The morsel was delicious, though it was difficult—and would continue to be, during the next four hours—for an amateur and glutton like me (in fact, for anyone who is being honest with himself) to tell whether my appreciation, fervent as it often became, had been enhanced by the description of the work and the ingredients that had gone into it. The tongue is suggestible. New words register as new flavors. As numerous blind wine tastings over the years have demonstrated, you taste what you want to taste. He cleared the slab and arrived with a plate with a spoon on it, and in the spoon a piece of fish with a chip on top. Over the next several hours, as he brought in course after course, he appeared and disappeared (“I’ll get you some more sap!”) like a character in a resort-hotel farce. But the dishes were a dizzying array of tastes and textures. Oyster mushrooms, palate-cleansing ices (one was made of wild carrot juice, stevia tea syrup, pickled baby maple-leaf powder, violet leaves, and lichen powder), cured turkey leg, mahogany clams, lobster, prawns, swordfish ham, brined pork with goat sausage—all of it subjected to a jumble of verbs and nouns, many of them new to me. Bull-thistle stem, chopped barberry root, ostrich fern. I deployed an index finger to dab up every woodland fleck. 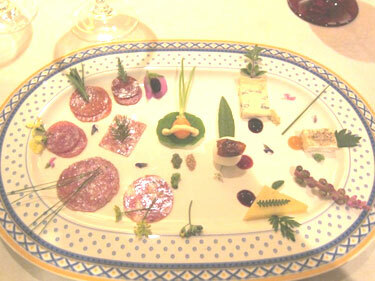 The platings were whimsical and inspired. The sprigs and needles that adorned the mid-meal platter of cheese and cured meat brought to mind Saul Steinberg or Paul Klee. Black Book was pretty enthusiastic. Chef Baehrel’s autumnal “Native Harvest” menu was heavenly. His lifelong obsession with food and nature pours out of every dish. The plates he served were developed, well-composed, and thought-provoking. The meal consisted of about 14 courses plus several extras, some of which Baehrel had been perfecting for decades and some of which were invented that day. In fact, many of the ingredients were seasonal and picked from his gardens that very morning, while a variety of ingredients had been preserved for years, waiting to be utilized at just the perfect time in their aging process. One of Baehrel’s new concoctions on the day we visited was a bowl of clams, warm pressed with wild hickory nut oil infused with spruce needles and “cooked” in a sauce made from ostrich ferns and topped with burdock root chips. Later, we sampled a dish that Baehrel has been continually refining: chicken thigh brined in staghorn sumac powder, then cooked in a blend of concentrated sycamore sap and Baehrel’s fresh grapeseed oil, surrounded by a sauce of rutabaga cooked in the soil it was grown in. Baehrel does not use butter in his dishes, nor does he use flour in his sauces. Instead, his sauces are often thickened with rutabaga. The buttery quality of a mouthwatering lobster dish served was deceivingly cooked instead in white oak acorn oil that was roasted with fresh white oak acorn, giving it a rich flavor. Each and every dish we ate that evening told a story. 4 Feedbacks on "Restaurant Damon Baehrel"
I’ll have the Big-Mac, small fries and a coffee. He loves what he does and gets paid to do it. Can’t do any better than that. Hold the coffee and make that a Chocolate shake and a Big-Mac. In the “Outback” of Oregon we have a not so dissimilar restaurant called The Cowboy Dinner Tree. Reservations required, atmosphere unparalleled. But not close to anything except for some awesome scenery.